This special four day workshop and is a hands-on history lesson about glass. On the first day we will create a “float glass face” and make a metal stand to display our creation, (Please see the Float Glass Faces workshop description directly below). You will have a chance to view Richard’s enameled glass collection. Next we will work with “tested compatible” Bullseye glass using 3 mm and 6 mm sheet glass, crushed glass frit mixtures, the liquid glass line method, multiple firings, silver foil, stencils, and various techniques that La Londe has developed. 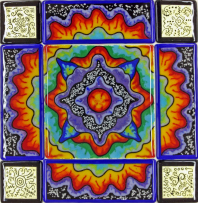 Each participant will create an 8″ x 8″ two fire “liquid glass line” pictorial tile, a 9″ x 9″ mandala, a 9″ x 9″ fused glass “cave painting” tile, make aluminum backing plates to mount your class tiles for wall hanging, and a “float glass face” with stand. This workshop will be held in Richard La Londe’s studio located on beautiful Whidbey Island near Seattle, Washington. 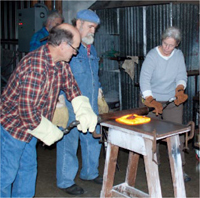 A field trip is planned to a local glass blowing/cold working studio and a “wine and cheese” hour will allow each participant to share their artwork with the group. Wonderful lunches will be served each day. 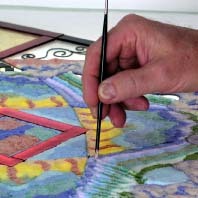 This is a chance for you to interact with a glass fusing pioneer in his own studio! Experience in basic glass fusing is suggested but not a requirement. 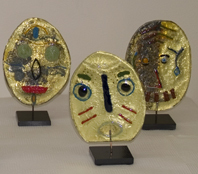 Float Glass Faces If you want to learn about fusing float glass, then this one day workshop is for you!We will work with float glass (window glass), vitreous enamels, silver and other metal foils to create a two sided dimensional face/mask – fused and shaped in a fiber blanket mold. You will learn how to distinguish the “tin side” from the “air side” of float glass and how to create reactions with mixed metals which can enhance your artwork. Learn about firing float glass and stopping devitrification. We will also make a metal stand to display our creation. This workshop is sometimes offered as a 1 day add-on or included with another workshop.